Does the upcoming CFMoto 400NK have on-paper specs to disrupt the segment? Chinese bikemaker CFMoto has teamed up with Bengaluru-based AMW Motorcycles for its distribution and expansion in India. While we had earlier seen the 250NK, 650NK and the 650MT testing on the streets of Hyderabad, the fourth bike, christened the 400NK, has also been spotted testing in India recently. It’s positioned to go up against the likes of the KTM 390 Duke, BMW G 310 R and the Benelli TNT 300. But aren’ the 400NK and the TNT 300 twin-cylinder motorcycles, so why would we pit it against the single-cylinder bikes here? You see, the KTM 390 Duke, despite being a single-cylinder bike, puts out similar power figures as the 400NK. And although low on power, we expect the CFMoto offering to be priced as competitively as the baby Beemer. With that out of the way, let's find out how this Chinese entrant fairs against its rivals on paper. The 400NK may have the biggest displacement amongst its rivals, but makes less power and torque compared to the KTM 390 Duke. However, with two cylinders at its disposal, the former should be less vibey and smoother on the go. Moreover, it will generate less heat compared to the single-cylinder 390 Duke. The BMW G 310 R’s tractable motor offers a punchy mid-range and quick in-gear accelerations which helps during quick overtakes. Essentially, it’s a perfect city dweller. On the other hand, the Benelli TNT 300 shares the same engine configurations as the 400NK, and is almost neck-and-neck in terms of power output. However, most of the power is produced way up in the rev range, while a low torque output means it’ll be a lot slower to get going. All the bikes come with a 6-speed transmission, however, the KTM 390 Duke benefits from the addition of a slipper clutch. The KTM 390 Duke's suspension setup is tuned to be on the stiffer side to aid its razor-sharp handling. However, thanks to separate function upside-down forks (S.F.F), the bike soaks in small undulations fairly well. Its braking setup (dimensionally the biggest), paired with sintered brake pads, translates to better bite and feel. And, for some added fun, the 390 Duke comes with a ‘Supermoto mode’ which switches off rear ABS, allowing the rider to slam on the rear brake and stick the rear out. A weight of just 149kg (dry) works in the bike’s favour too. However, a tall seat height of 830mm could be a hurdle for shorter riders. On the downside, its rather small 13.4-litre fuel tank and a thirsty motor could see you visiting the fuel station quite often. On the contrary, the BMW G 310 R pretty much glides over speed breakers and bumps. But that doesn't mean the bike isn't a good handler - it’s just as good in the twisties. A kerb weight of just 158.5kg also aids its handling prowess, while making it easier to manoeuvre in the parking lot. A low seat height of 785mm is a boon for short riders. BMW Motorrad also offers two optional seats, 770mm and 800mm high. That said, its 11-litre fuel tank is the smallest amongst the competition. The Benelli is the second heaviest bike in the comparison weighing in at 185kg. Naturally, because of the weight, it requires a lot of effort while chucking it into or out of corners. That said, its disc brake setup offers great bite, good feel and even features dual-channel ABS as standard now. Its comfortable ergonomics make the bike good for daily commutes and long hauls. And with a 16-litre fuel tank at your disposal, you could stay on the road a lot longer than the competition. It gets a low seat height of 795mm, second to only the BMW G 310 R.
The CFMoto which tips the scale at 206kg, is the heaviest of the lot. And the weight is likely to affect the way it handles, both in city traffic and while pushing it into corners. On the upside though, the 400NK's twin discs at the front and one at the back could make for a good braking setup, while its chunky tyres should offer better stability. Its 17-litre fuel tank too is the largest of the lot and a seat height of 815mm should be accessible for riders of all heights. If you’re looking for an outright performer, the 390 Duke is the way to go. It’s the most powerful bike here with a ton of features, all at an affordable price. 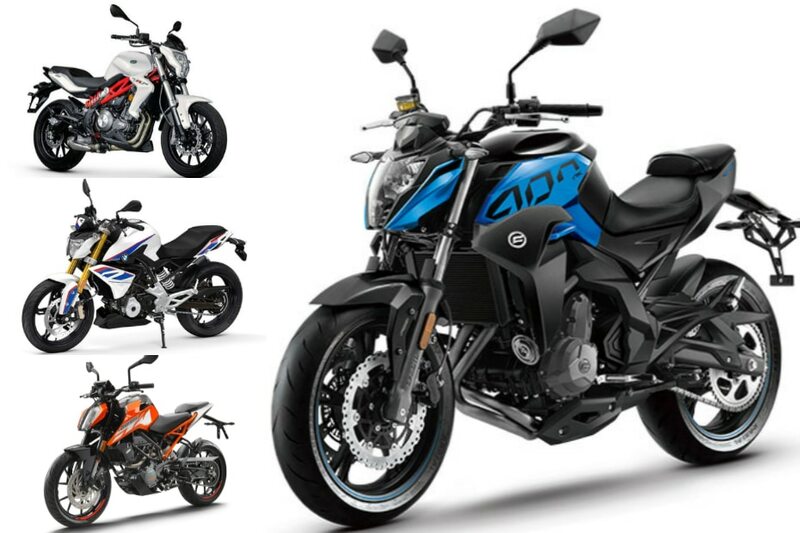 The CFMoto isn’t a well-known brand and if you want a premium product with a well-renowned badge, the BMW G 310 R would be the apt choice. Neither the Benelli's performance nor the handling will win you over, but if you find the inline-two cylinder howl intriguing, you could consider the bike All said and done, the CFMoto 400NK will offer a big bike feel with sufficient power at your disposal. Besides, it looks bloody damn good too, and there’s no denying that.